The KrowdFit Wellness Score is based on research and clinical data developed by the Center for Disease Control, the National Institute of Health and the American Heart Association. KrowdFit® the recognized leader in milestone driven, cash incentivized wellness reward programs, today announced its new Wellness Scoring system. The KrowdFit Wellness Score is a calculated number from 1.0 (low) to 5.0 (high). It moves up or down, depending on how the 30-day average of a member’s Steps/Sleep/Meals/Activity data changes. 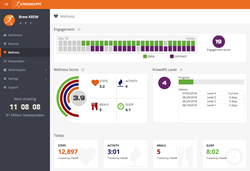 KrowdFit’s Wellness Score has been developed as a way to measure and inform a member’s quantitative life, helping them make sense out of a large amount of health and wellbeing data. We simplify the data from multiple sources and activity types into just one number to compare against published guidance and the broader base of Krowd members. “When it comes to employee wellness, engagement is absolutely critical. We’ve demonstrated very high sustained engagement rates of 72% over the past four years and the release of our new Wellness Scoring will add to the effectiveness of KrowdFit’s ability to engage, recognize and reward sustained healthy, active lifestyle behaviors” said Jim Miller, CEO and Founder of KrowdFit. As members provide activity data from their various sources KrowdFit “grades” the Level of that activity against the members 30-day trailing average, age and gender. The different counters are weighted from light to heavy by meals/sleep/steps/activity. As the member provides data KrowdFit considers the quality of that data, the consistency with which it is provided, and builds or estimates an average. That average is then scored against the research supported targets for age and applied to the score. As the member maintains a good “grade” by staying engaged with the system the Wellness Score is applied to Level progression. Level progression is constant within KrowdFit and cannot be lost. As a member engages and is scored for their wellness they earn “XP” toward Level advancement. As member Level increases they earn perks in the form of “Amp’d” entries into KrowdFit’s existing Krowd Funded cash giveaways. Amp’d entries are earned and rewarded daily and must be claimed by members during a daily check-in. If the member doesn’t check-in and claim the reward it will expire for that day. Levels aren’t capped, and members who are consistently active and engaged will continue to accumulate XP and Levels within KrowdFit. Amp’d entries will be provided for various KrowdFit giveaways based on Level progression. Another factor in the Wellness Score and Level progression is the member’s engagement within KrowdFit. This is measured by the number of data days received from fitness trackers coupled with the number of days a member signs in to the app. A member must have an Engagement Score of 21 or more in a month to be considered fully engaged. KrowdFit will begin calculating the Wellness Score after seven days of data, and Level progression will begin as the Engagement Score rises. Members who don’t meet a minimum Engagement Score of seven will start to lose Wellness Score and XP applied to Level progression. As the member’s Wellness Score returns to a resting state the member will no longer earn XP applied to Level progression. We believe the Engagement Score and Wellness Score will be a better representation of how members are using the KrowdFit program and amplify their reward opportunities.